Study on the Breed of New Kiwi Furit Cultivar Wang Mingzhong;Li Minzhang(Sichuan Institute of Natural Resources,Chengdu 610015)Wu Baiyue & Hou Shixuan(Cangxi Agricultural Bureau of Sichuau,Cangxi 628400). Influence upon the Leaving Rumen Microflora Quantity and Type in Different Eco-environment Deng Maochang;Hu Daize;Lang Jiawen;et al(Sichuan Natural Resource Institute,Chengdu 610015). The Certification of True and False Seed of Cassia Sopneraiinn L Liu Jianzhao; He Longfei; Zhou Yuemin;Tao Chunniang & Ai Suyun (Cuangxi Agricultural University,Naaning 530005). Exploiting and Developing the Biological Resources of the Langya Mountain National Forest Park ZhengPingjian &.Zheng Chaogul(Geography Department of Chuzhou Teachers' College,Aubul,Chuzhou 239012). Agricultural Division and Its Industrialization Yu Yongxiang (Liaoning Kazuo Agricultural Division Office,Kazuo 122300). Climate Suitability Division of Actinidia Chinensis in the Mountain Areas of South Anhui Wang Xiangyaug(Huangshan Forestry School,Anhui Province,Tunxi 245041). Research on Soil-Forming Feature Semi-Arid Basin at the Upper Section of Minjiang Chen Xuehua(Chengdu Institute of Mountain Hazards and Environment,Academia Sinica,Chengdu 610041). The Present Situation and the Problems of Non-Agricultural Land Utilization in Sichuan Rural Area Xu Jie(Sichuan Territory Bureau. Chengdu 610012). Developing Strategy of Tourist Resources in the Southeast Area of Yunnan Tian Li(Tourist Department of Ynnan Univeristy,Kunming 650091). 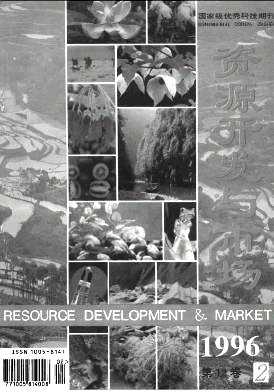 Some suggestions of Comprehensive Developing the Agriculture in Danzhou Ma Bin(The College of TropicalCrops in South China, Danzhou 671737).